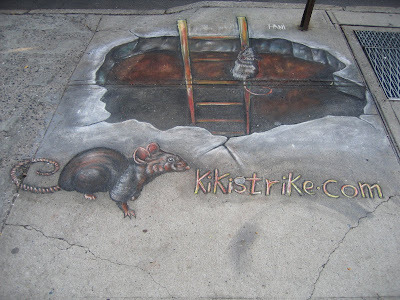 Ananka's Diary: Kiki Strike Sidewalk Art! I really need to move to New York! I wonder what some people think as they walk over the "endless pit..."
Dude! I would hate someone walking on it. I would guard it, buy an orange outfit and put cones around it. that is so cool! u should put those everyhere!like all over the u.s.! make one look like a swarm of rats to scare mean people!